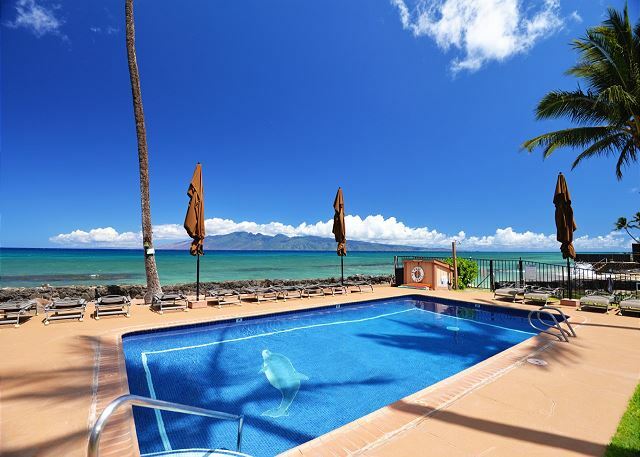 Hale Kai is a small, Friendly Condominium complex in the Lahaina, Kaanapali, Honokowai area of North West Maui. The complex offers free parking and has on-site laundry facilities. 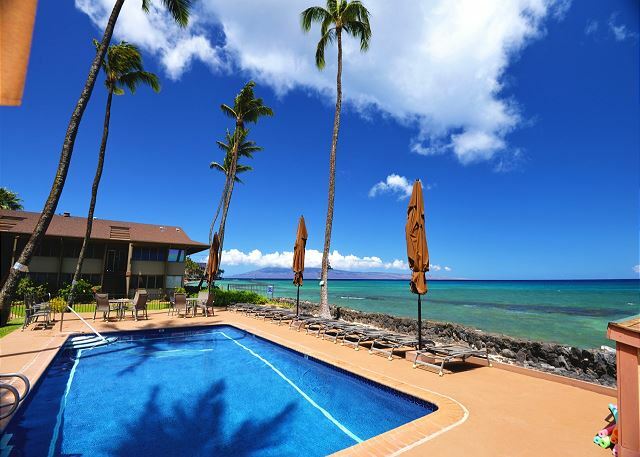 Hale Kai has a pool overlooking the ocean with plenty of lounge chairs, table seating, and barbecue grills for your family gatherings. 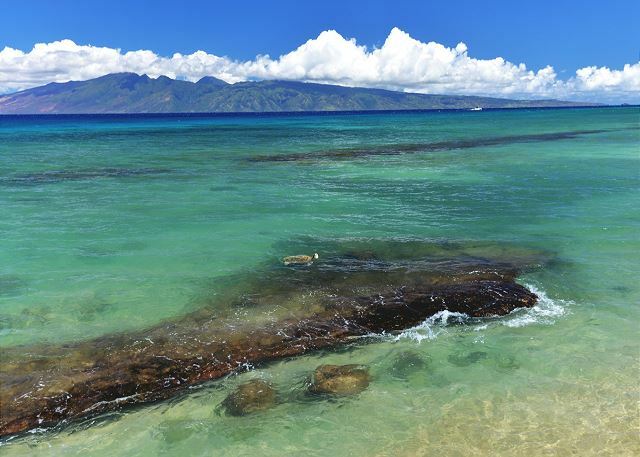 Nestled between Lahaina and Kaanapali to the south and Kapalua to the north, Hale Kai is minutes from the best west side beaches, shopping and world class restaurants. 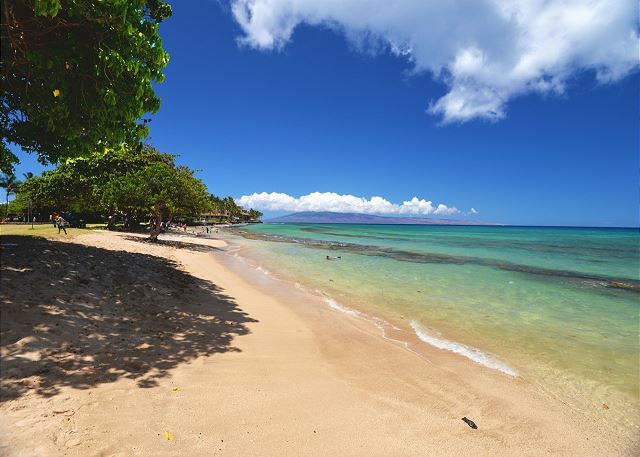 The Honokowai Beach park, with its beautiful family friendly beach is next to the Hale Kai complex on the south and a private beach on the north side of the pool area accessible to Hale Kai guests. The condo itself has great views of the ocean and the beach. 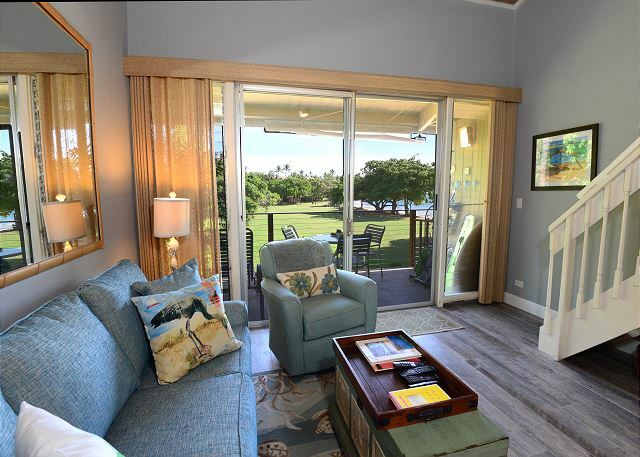 Sip your most desired beverage from the privacy of the living room or lanai. Experience whale watching during season and enjoy amazing sunsets all year. The mirrors in the living room and lanai enable a unique visual perspective from almost any angle. 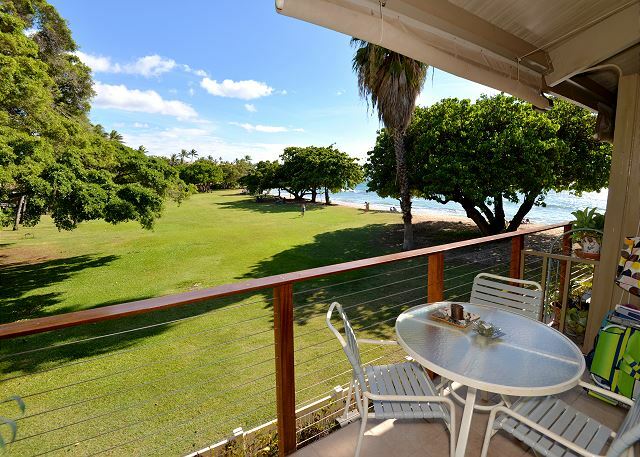 Have breakfast, lunch or dinner on the comfortable lanai facing the Honokowai Beach Park, The park is generally quiet, and is a great for picnics, sunbathing, yoga, tai chi, and other fun activities. The ocean on the park and Hale Kai private beach are generally gentle and ideal for children water activities. 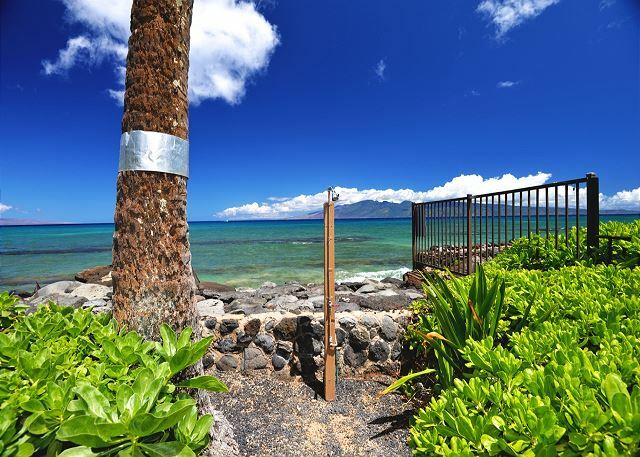 Standing on the two beaches or the pool area you can see the islands of Lanai and Molokai. 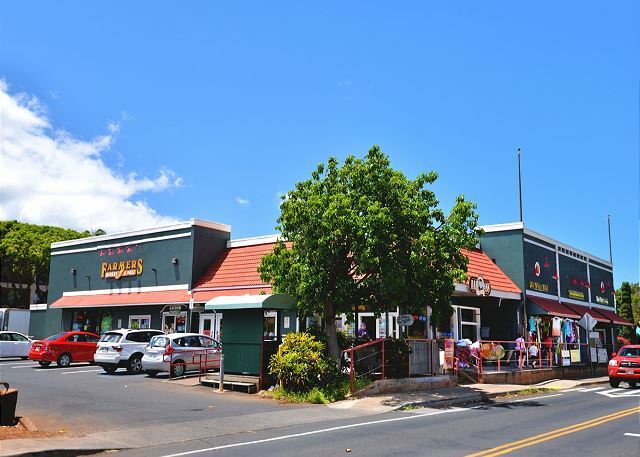 The famous Honokowai Farmers market with its homegrown organic delicacies is just a short walk across the street. Other favorite local stores include coffee, food, art gallery and general merchandise. Visit Boss Frogs if you want to rent bikes or gear-up to snorkel, surf and paddle board! Imagine: during the day you can enjoy the great weather, beaches, Trade Winds, and local amenities, and at night you can enjoy the often clear skies and beautiful stars. If you like Jazz, visit the Java Jazz & Soup Nutz a few blocks away. Java Jazz serves a wonderful breakfast, lunch and dinner along with a jazz band several times per week and weekends. 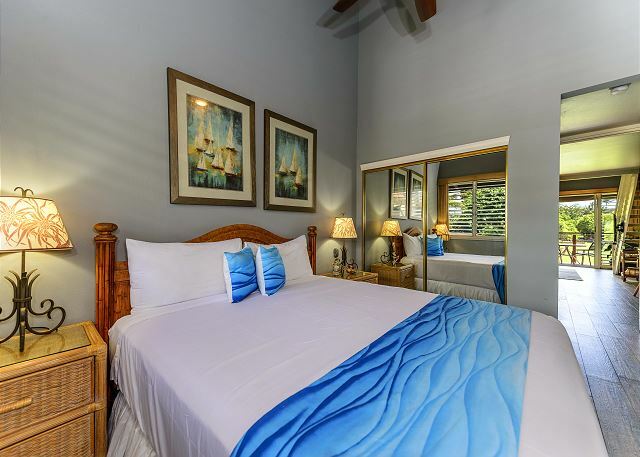 This spacious condo has 2 bedrooms and 2 full baths. The condo is complete with many upgrades including new ceramic wood plank flooring on the main and upper levels. 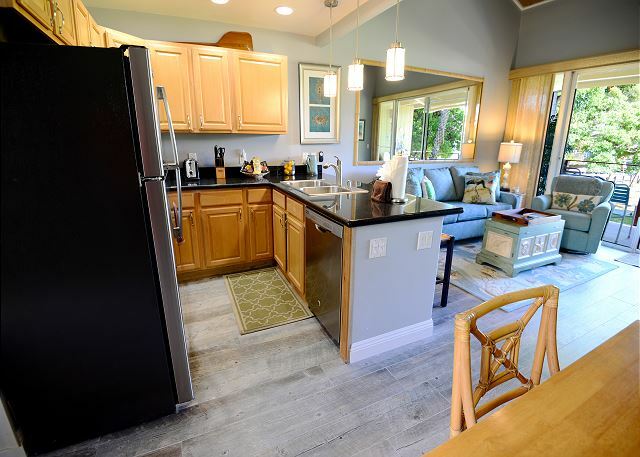 The main level has a fully equipped kitchen with granite kitchen counter tops, new light fixtures, and all new stainless steel finish kitchen appliances - fridge, stove, microwave, dishwasher, coffee maker, and kitchen sink and kitchen faucet. 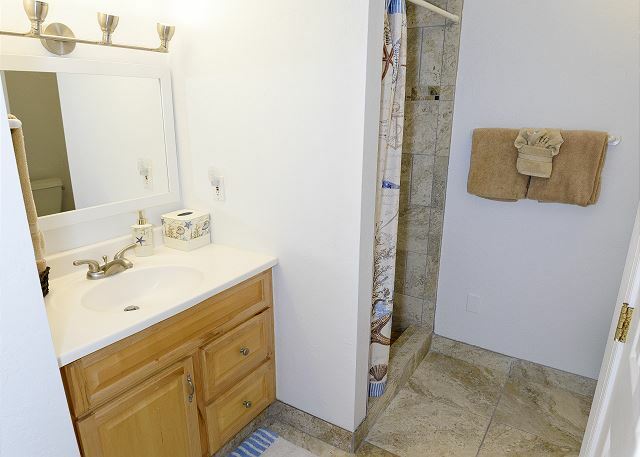 The two bathrooms offer ceramic tile flooring and showers. There are new ceiling fans in the living room and bedrooms. The ceiling fans are complemented by floor fans, giving you cross-ventilation when needed. All the ceiling fans have an LED light and a 3-speed remote control. Dimmer switches are everywhere to help you create the right mood for your vacation special moments. 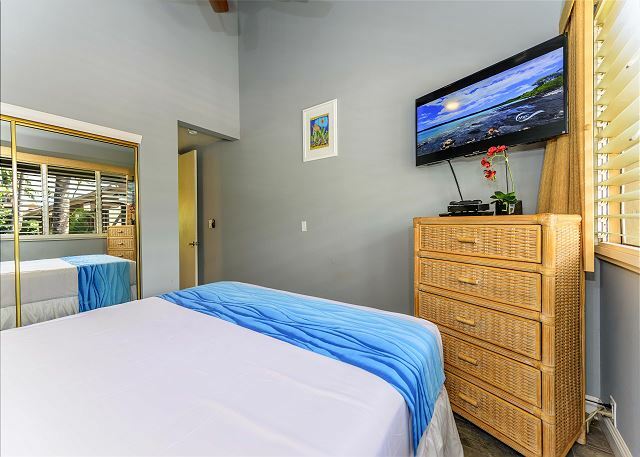 Three flat screen TVs, each with basic cable and DVD player, provide ample entertainment options. The TV’s are located in the living room and each bedroom. The living room and upstairs bedroom have new 55" LCD TV's. Relax, look no further. After a long day of fun, sun and surf, listen to your favorite music, or watch your favorite movies and TV shows. The condo provides free high speed Wifi with private access and is encryption enabled. So, stay connected if and when you want, or just check-out and embrace the power of Maui. NOTE: The staircase leading to the upstairs bedroom is narrow. Extra caution should be taken when walking up and down the stairs. Avoid the big costly hotels, mega condo complexes, escalators, elevators, and per day Internet and parking fees. 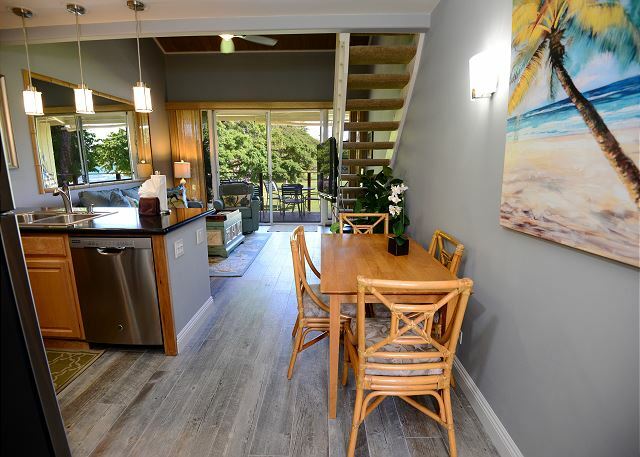 Don’t delay, book your Maui vacation at 208 Hale Kai today and enjoy all that Maui has to offer in a pleasant relaxed newly renovated beachside condo! 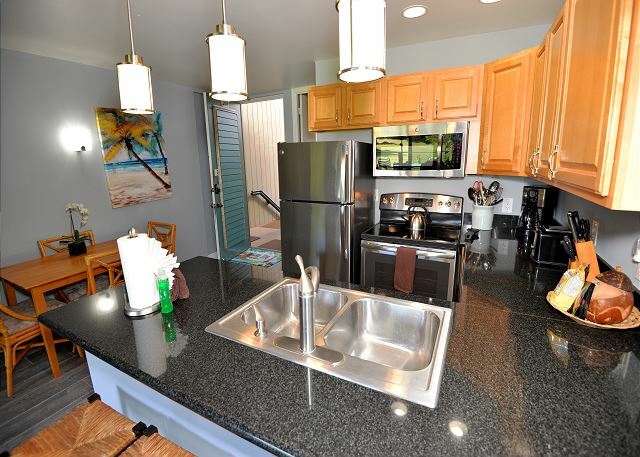 5/5 stars Review by Brittany H.
This condo was fantastic for our family vacation! Fun little beach, close to major areas, and the other residents of the building were so nice! Our girls loved playing on the beach side of the rock "break walls" because the water was claim and easy for them to have a great time. Got to see turtles twice on the private beach and they were awesome! Would definitely stay again. Can't imagine a better location, on the water next to a state park and across the street from a natural foods store and Farmer's Market. Great, affordable seafood at The Fish Market a block away. Excellent coffee available at Bad *** coffee. Lovely to stay in a place where we could walk to shop for food. Saw a giant sea turtle on our private pocket beach. Nice pool and plenty of lounge chairs, and our fellow guests were very welcoming. Nice laundry room and little free library. Loved our condo, perfect for my mother and sister and me. Wonderful sunsets. We would absolutely come back. 4/5 stars Review by Stacie S.
We had a great time! Definitely coming back asap! My family and I LOVED this condo and it’s location. We were a little nervous after reading some reviews but you shouldn’t be! Close to everything we wanted to see and do loved the pool, it is right at the ocean! We would swim and just marvel at the view. Only a couple of small beaches are right at the property but they’re perfect for getting wet in the ocean. If you want to go to a bigger beach you have to travel a little bit. The condo had everything we needed except air conditioning, which we were prepared for. Plenty of fans! Can’t wait until we can come back! My husband and 8yr old son came to Maui for a wedding in August and from the start, the booking process and working with the property manager was fantastic! The place was cute and well maintained. A bit on the old side and in need of love here and there but overall, a great place in a great location at a great price. We spent most of our time in the pool and at the quiet private beach next door where turtles happily joined us in the water! The condo does not have AC but plenty of fans and air circulation. And then the hurricane came! Our flight was canceled because of the flooding, fires and weather so we needed to book another day which they accommodated without issue. There was also flashlights and batteries in the condo for when the power went out which was nice. We did receive ample notice as well should we need evacuation. We would highly recommend this condo to anyone looking for a cute place to stay. Our son LOVED his room upstairs and the area was very close to everything we needed. Staff was friendly and we were happy to call it home for 10 days. All in all, an experience we will never forget! 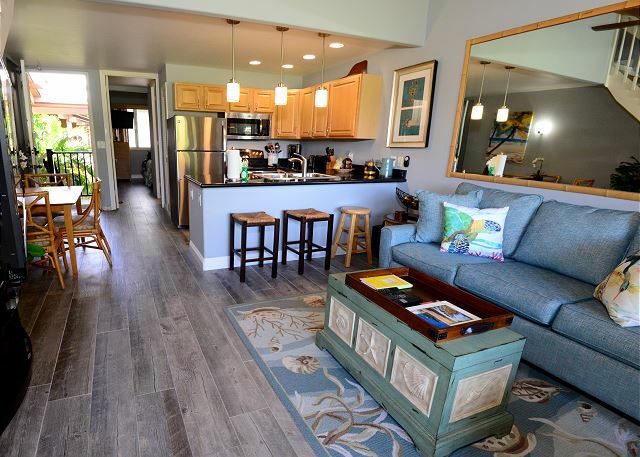 4/5 stars Review by TA - Courtney M.
We really liked this vacation rental, mostly for the location. It is right on a great beach for little kids - and we had two with us. They have chairs, some toys, towels - most things you would need for the beach which is great. The only real downside is that there's no AC, which most nights wasn't too bad, but a couple of nights were pretty hot and the upstairs loft was very warm. Downstairs stays cooler, but you do have to keep the bedroom door propped wide open and the outside sliding door open to get the cross breeze. The windows the in the bedroom must also be open of course which means a lot of noise from the road and parking lot. I'm a pretty light sleeper so this was an issue for me, but not my husband who sleeps harder. Just something to take into consideration when weighing your options. The pool is small but very nicely maintained and a perfect temperature. Again the beach there is GREAT! Store right across the street is amazing, as is the pizza "truck" down the street. There is also really great snorkeling right off the beach if you swim out 20 years or so, which was a fun surprise! 4/5 stars Review by Fiona B. This condo complex is quiet and friendly. The condo had a few issues, but the realty employee listened and responded to our needs. 5/5 stars Review by Ashley N.
Great location, condo structure is dated, but rental unit is nicely updated, grounds are beautifully kept, access to ocean and mountain view from pool is spectacular. Unit was conveniently stocked with beach chairs, umbrella and snorkel gear. Kitchen is very small - only one cook at a time, but worked fine for our need. Blender and common grill worked well. 3/5 stars Review by William B. The stay was okay - the room was nice and clean and the sheets on the bed are the softest I've ever slept on. It had everything we really needed, and we weren't there much anyways. The location wasn't very good (no real swimming beach access, no easy access to shopping). The stairs to the upstairs loft are too steep, the bed in the main bedroom is too soft, there was a LOT of noise from outside. Parking was an issue, as we never did receive a parking pass - the form wasn't there when we got there (but got one very soon after I sent an email to our rep), but the pass never did come.BUT, you can't really have a bad stay on Maui! I Would Have Wanted Someone To Tell Me..
1/5 stars Review by Christina E.
My husband and I chose this condo for our honeymoon. We arrived around 3pm, hit the beach for a bit, then quickly changed our clothes, and went to dinner. When we returned to the condo after dinner, we had to kill about 10 roaches in a matter of 10 minutes. I would like to point out the professional manner in which this was handled by both the rental agent and owners. However, if this had happened to someone else, I wish they would have told me. We only saw a few after our first night, but at that point all sense of ease was lost. We kept our luggage on the kitchen table, I was constantly looking at the floor with caution, double checking my shoes before I put them on, and shaking out my clothes and towels before putting them on my body. Another thing that ruffled my feathers was that we received a reminder of the quiet hours. As sad as it seems, we were stuck on our time zone, and were asleep before quiet hours even hit, so I didn't quite understand how we became the ones to blame. I will say the pool was nice, and we did see some sea turtles. 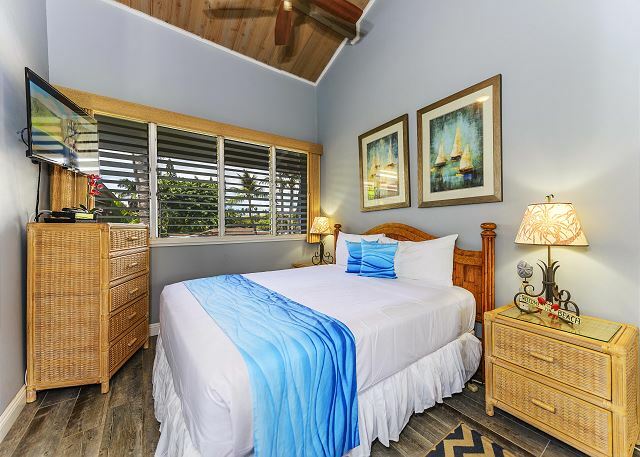 4/5 stars Review by Anita L.
We really enjoyed our stay at Hale Kai, having read some of the reviews we were a little apprehensive, but the property was exactly like pictures. Very nicely decorated, clean and fabulous views of the ocean. The property was well stocked with basics including dishwasher tablets which was great. The kids loved all the snorkel equipment and body boards. The beach chairs were great too. 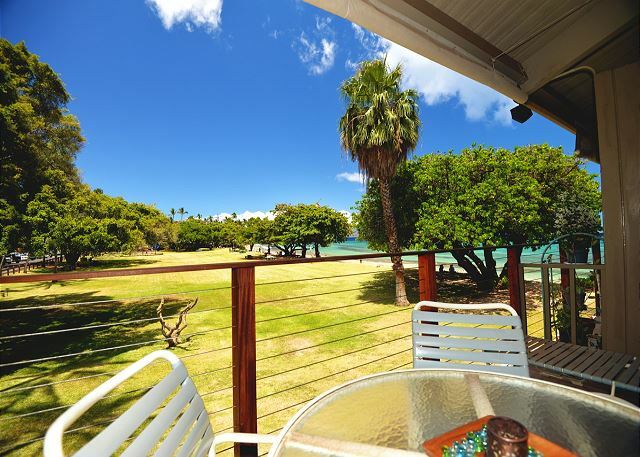 We didn't find the accommodation too hot, we kept the slats open and the trade winds kept the property nice and cool. Swimming with turtles everyday on the small private beach was a highlight. We definitely would recommend this property to friends and would stay again. A great location and property. 5/5 stars Review by Jody S.
ok stay. it is not a true 2 bedroom, but rather a 1 bedroom with a loft. Which was so hot that we could not sleep in the loft and had to put our 2 year old in the family room so we could sleep in the downstairs bedroom. Overall, it was decent, but definitely needs some fixing up. The property manager was really great - our floors were not clean when we got there and she had the cleaning service come back and mop, which made a huge difference. 5/5 stars Review by Mark H.
We had two very minor hiccups that were addressed by the property management company professionally and quickly. These minor items did not impact our stay at all. We would absolutely rent this unit or any other listed by them without hesitation. 4/5 stars Review by Deborah W.
very convenient location! next to a public park, hmmm. complex older, yet well maintained. pool & beach small. although the condo has been renovated nicely it just was lacking for us. but, the sea breezes and sound of surf the best!and we saw sea turtles on the beach!! 3/5 stars Review by Brian S.
Nice Location, we had great weather right on beach and Park off lanai is great to watch kids play. Stairs at apartment are very narrow and shallow steps need to be noted especially coming down for safety. kitchen had all amenities needed. We had 6 booked to be staying but had to call for bedding sheets for pull out sofa We did steal some overcovers from other room but kids had to sleep on mattress 1st night. Was a positive that after we called again we were supplied with 3 extra beach towels as we only had 3 on arival we would expect the beach towels on a condo rental to match the # of renters. 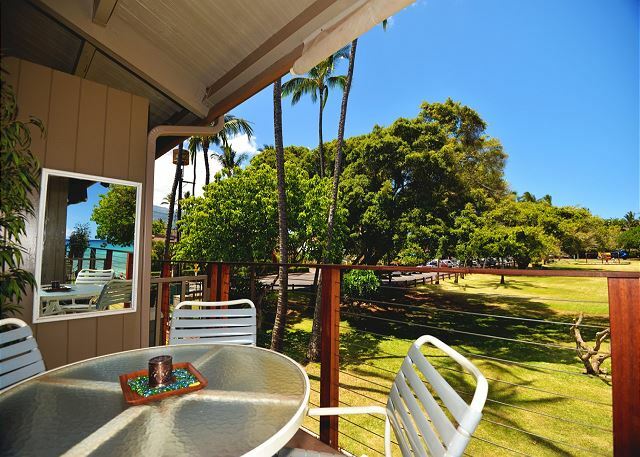 Beautiful Maui and great Condo location with friendly co renters and long term owners very welcoming. Overall we had a very good experience with the Hale Kai property. The unit was spacious and had everything we needed. The location was convenient and the beach was next door. Here are some things that are helpful to know about the unit. Although the beach is next door, the ocean at this beach has strong currents (warning signs posted) and no one used it for any swimming or boarding while we were there (we used other nearby beaches for swimming). The refrigerator door does not like to stay shut so we had to make sure that nothing was stored in the door shelves and had to constantly make sure the door was securely shut. Hot water is limited and with 3 people showering, the last person sometimes ran out of hot water near the end of their shower. 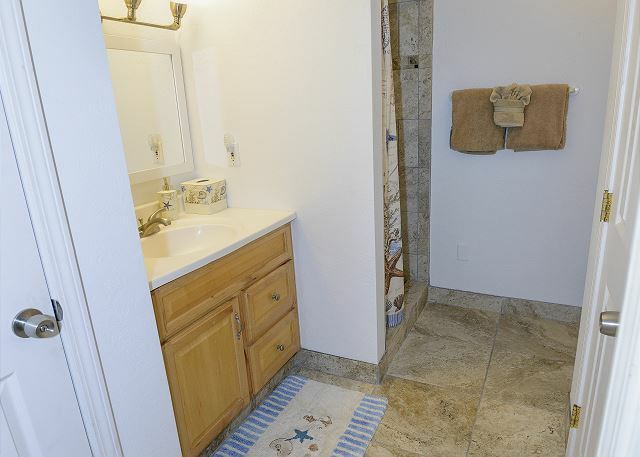 It also would have been nice to have a few more towels in the unit. Nice, but not quite there! 3/5 stars Review by Suzy K.
Some fittings have been upgraded but the fixtures & general decor were tired & shabby, especially the paintwork throughout. There was no wardrobe space. One space held the hot water tank, numerous boxes & tins of paint, the other bulky items of "stuff". We had to improvise when hanging clothes up! The top two stairs to the upstairs bedroom were taped with blue insulation tape & the upstairs portable a/c unit had a split hose taped together which had slipped open in the heat, these two issues were dealt with the next day after a phone call but the upstairs room is unbearably hot regardless of fans. We did not get any checkin details until we arrived at the airport, this was only because the realty company were prompted the night before we flew. The info when it was received had out of date log in details for the condo's wi-fi, so it took some time to sort that out when we should have been out enjoying our holiday. It took 3 days to get a parking pass, which we did not know was required & this was only by request once we realised. The realty company responded when asked but these were standard operating procedures. The site office did not deal with our condo, so all requests had to be made by mobile phone at our expense. A chopping board & instructions on how to use the coffee machine would have been helpful. The insect guards on the balcony were in desperate need of a refresh & they were not easy to pull across. Sound insulation was not adequate so the young child next door who cried at all hours of the night could have been in the same room. It wasn't all bad, the condo was well equipped & comfortable & everything in the kitchen & bathrooms worked well. The view from the balcony was lovely, it is very well situated for the great local amenities. The pool was small but functional & the almost private beach had good swimming. This was our second trip to Maui. We chose the Hale Kai location because we need it would work well for us and it did not disappoint! The condo was clean and inviting and the property manager was prompt to reply with tips, questions or concerns. Thanks so much for a great vacation.